Thermoplastic and plastisol are two types of plastic coated steel outdoor furniture that creates the standard for commercial quality. 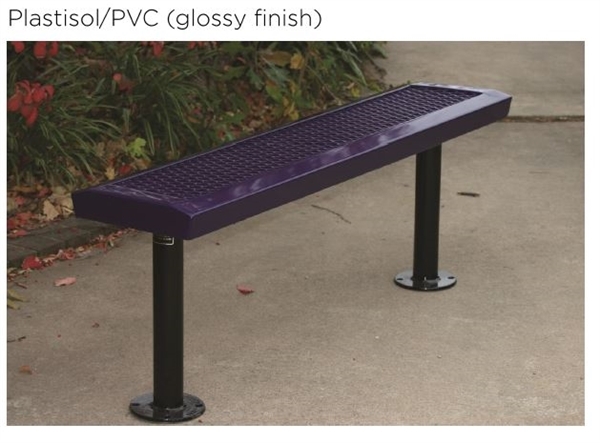 Thermoplastic and plastisol site amenities include picnic tables, benches, and trash cans. Thermoplastic site amenities are popular as they are commercial quality built to last. 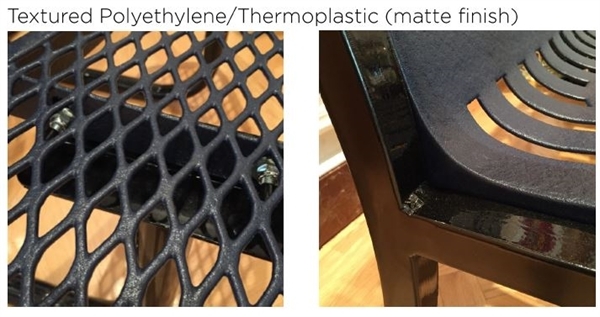 Thermoplastic outdoor furniture is placed in a liquidized vat where the product is heated, dipped, and baked. The textured matte thermoplastic coating hides scratches and marks by providing a clean and smooth appearance. Unlike plastisol, textured thermoplastic leaves no drips on the product. Thermoplastic is the preferred coating of choice for many customers in schools, restaurants, parks, and many more venues. Plastisol is the traditional coating that is liquid PVC. The product is dipped in plastisol and baked, creating a hardened surface. Plastisol has a glossy appearance with UV protection. Plastisol products have a clean top, however underneath you may see drip marks.